If you are in the market for an embroidery machine, you must already know by now just how difficult it is to figure out what device does a better job. This is because unlike sewing machines, embroidery machines need to be tested in order to take inventory of their exact capabilities, which is quite difficult to do when you’re buying online. This is more or less why you should perhaps rely on reviews and opinion pieces to make an educated purchase when the time comes. Let us then take a look at the ten best emvroidery machines the market has to offer at this point in time. 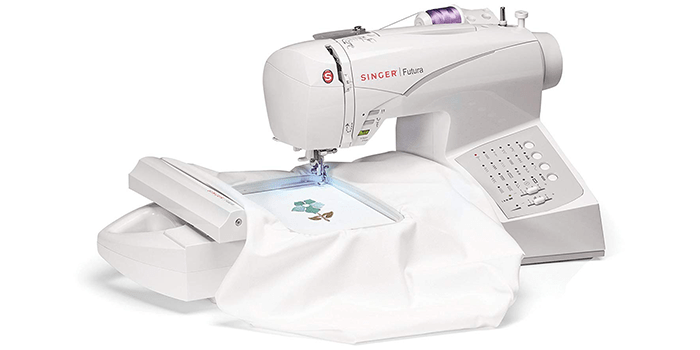 The Singer CE-150 Futura Sewing and Embroidery Machine is an all-in-one machine that includes two automatic single-step buttonholes and up to24 inbuilt stitches. Other features include an automatic needle threading tool and an easy to use bobbin system that allows quick set up before stitching. Thanks to the latest technology and design, the needle up/down can be programmed according to your requirement and allows free motion stitching. Including 120 embroidery designs built into the system, it comes with 5 additional fonts for monogramming purposes. Unlike most of its kind, this embroidery machine can read most design file formats that are loaded onto the machine. The Singer XL-420 Sewing and Embroidery Machine is a premium quality machine that is equipped with 200 embroidery patterns in small, large and endless designs. Featuring an embroidery hoop measuring 6.75 x 4 inches, it comes with 30 inbuilt stitches and 5 different fonts that can be utilized for monogramming. Crafted and constructed with durable materials, this embroidery machine is compact in size and extremely portable and easy to operate. 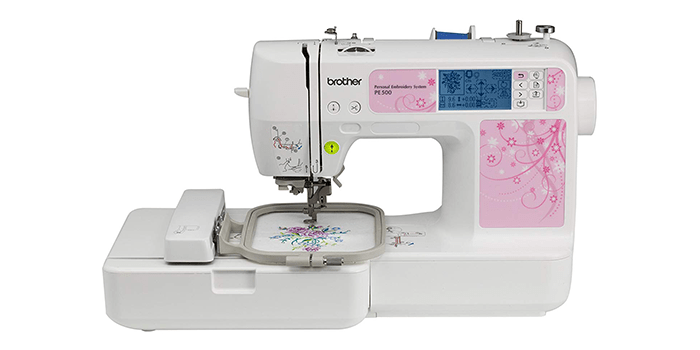 Crafted and designed for an easy and enjoyable embroidering and sewing experience, the EverSewn Hero – 400-Stitch Computerized Sewing Machine comes with a great set of functions and features. 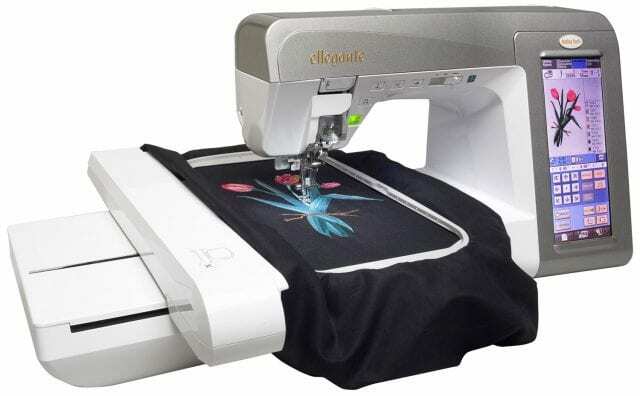 Including over 400 utilities that consist of decorative stitches and patterns, it also comes with 40 built-in embroidery designs and an automatic needle threading feature. With an embroidery design space measuring 110mm by 170mm, it includes a workspace measuring 6.5 inches. 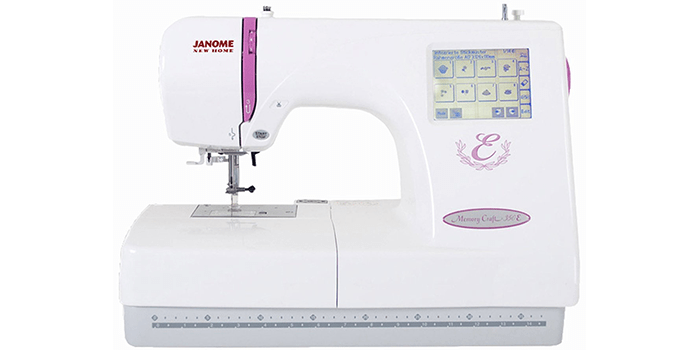 Compact in size and light in weight, this machine comes equipped with 8 varieties of presser feet as well as an upper needle and bobbin thread level monitor. 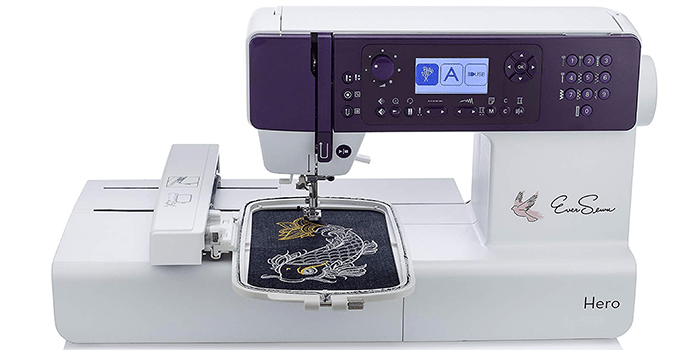 The Memory Craft Embroidery Machine is a durable, lightweight, portable machine that is crafted with an embroidery area measuring 5.5 inch by 7.9 inch. Including an inbuilt USB drive that is compatible with most USB sticks, it allows users to upload their own customized designs onto the machine for embroidering. Along with this, it also includes a needle threading tool and an automatic thread cutter that is built into the machine to help with quick and easy operation. Ideal for creating home decoration items, small sized embroidery designs for garments or accessories etc. 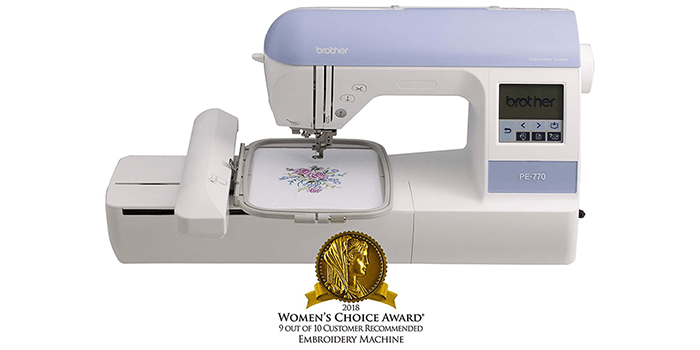 Equipped with a 4 by 4-inch embroidery space, the Brother PE500 Embroidery Machine allows easy creativity of large embroidery patterns and designs. Allowing quick and easy computer connectivity, this machine comes with a cable that can be connected to your computer to import designs and patterns. Crafted and designed with a back-lit, touchscreen LCD display, it allows users to preview and edit their designs if needed. It also comes with 70 inbuilt designs and patterns and 5 lettering fonts to help enhance your masterpieces. Equipped with 215 inbuilt stitches with two automatic single-step buttonholes, the Singer – Futura XL-580 Embroidery and Sewing Machine includes 250 embroidery patterns and 5 fonts with outlined lettering. Unlike others of its kind, this embroidery machine comes with an LED light that enhances visibility and prevents eye strain while working. Featuring an automatic needle threader, this machine is uniquely designed to allow users to customize their embroidery patterns and styles on the computer before creating them on the machine. 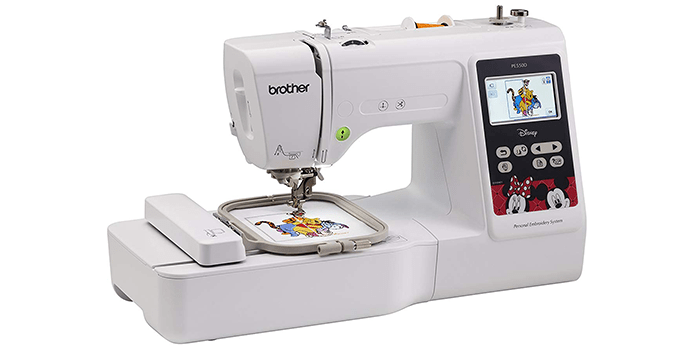 The Brother Computerized Sewing and Embroidery Machine – SE1900 is an automatic, multipurpose machine that is loaded with a great set of features. Including a large 3.2 inch LCD touchscreen, it allows users to preview their designs and edit them before beginning the stitching process. Unlike others, it also includes a larger embroidery space measuring 5 inch by 7 inch, which is ideal for larger designs. With 240 inbuilt stitches, this machine features 10 frames and 11 fonts including 1 Cyrillic, 7 English, 3 Japanese for monogramming purposes. The machine also comes equipped with 8 sewing feet that include overcasting, blind stitching, buttonhole, embroidery feet, overcasting, zigzag, button fitting, and zippers. With an embroidery area measuring 4 by 4 inches, the Brother Embroidery Machine – PE550D is a reliable and efficient machine that is both durable and budget-friendly. Including 125 inbuilt designs including 45 Disney designs, it features floral patterns, borders, lace patterns, holiday designs, and exciting kid’s designs. The machine also comes equipped with an inbuilt memory that allows users to import their own customized designs via a USB stick. 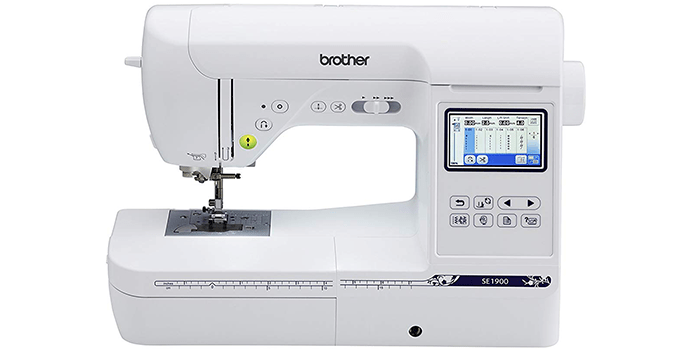 Designed with a large LCD display measuring 3.2 inches, it allows users to check the design before the stitching process begins. Other embroidery editing features include two-line printing, mirror imaging, rotating, moving, resizing and arching of alphabet. Equipped with an expansive space, the Brother Embroidery Machine – PE770 offers a large area for creating large designs and projects that include lettering of any kind. Featuring 136 inbuilt designs and patterns, it includes 10 different frames, 6 fonts and 12 borders that helps in creating your own masterpieces. Thanks to its inbuilt memory, it allows you to import your own designs via a USB stick via the built-in port. With an embroidery speed of up to 650spm, it comes with a wide range of features that include mirror-imaging, rotation, size editing and more. Easy to thread and extremely accurate, this machine is durable, reliable and portable. 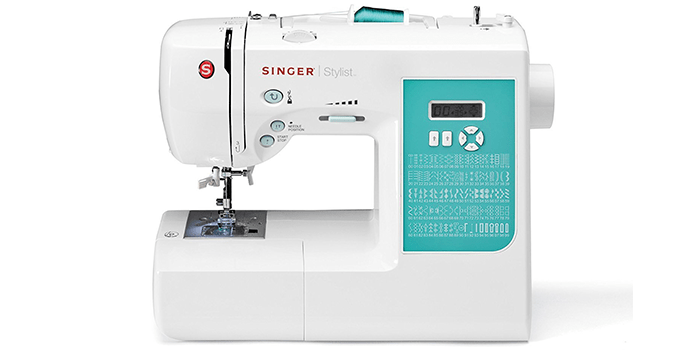 Known for its brilliant performance, quality, and its exceptional features, the Singer – 7258 100-Stitch Computerized Sewing Machine is among the best of its kind. Including an easy to use push button stitch selector, it allows users to choose the required stitch with just one click of a button. Other settings like length and width are adjusted automatically but are also customizable if needed. Featuring 100 decorative inbuilt stitches, this embroidery machine comes with an automatic needle threader and a pack of bonus accessories. Constructed with a sturdy, heavy-duty metal frame, this machine ensures a reliability and durability like no other in its price range.